One of the ironies of secular geology is that the same people who claim to accurately report historical events billions of years in the past have a hard time doing the same over a few decades or centuries. This is illustrated by the recurring myths surrounding one of the founding fathers of modern geology, James Hutton—myths that began shortly after his death. 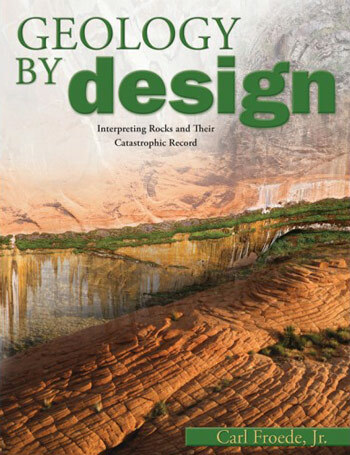 Aspiring geologists are taught that Hutton was a bold empiricist and rational thinker, who cast aside biblical superstition, conceived of uniformitarianism, ‘saw’ deep time in outcrops, and thus fathered the science of geology. His genius was unappreciated until Charles Lyell ‘rediscovered’ his work and finished the fight to cast off the shackles of Christianity. But this heroic saga falls far short of historical reality; so much so that cynical students of history might be tempted to label it propaganda. Geologists got this story wrong for nearly two centuries, giving us yet another reason to question their credibility as the caretakers of a much more obscure past. Figure 1. 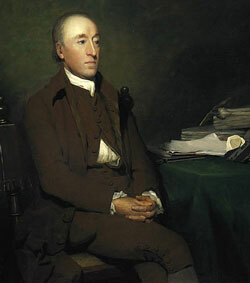 James Hutton (1726–1797) was one of the leading lights of the Edinburgh Enlightenment, famous for his geological theory set forth in his book, Theory of the Earth (1795). For more than 150 years, students of geology have been taught that James Hutton (1726–1797) was the father of modern uniformitarian geology. We are told that he was a brave empiricist, a secular saint, struggling against the strictures of the dominant 18th century church which sought to repress his work because it threatened their Mosaic monopoly on history. But his indefatigable courage and indisputable field evidence, combined with his uncanny insight into the expanse of deep time, struck a blow against medieval superstition. His message was hindered for a few decades due to an obtuse writing style, but as it was clarified by John Playfair (1748–1819) and Charles Lyell (1797–1875), it inspired a generation of British geologists to build the science of geology that we know today. It would make a great television special … even though it is a myth. That Hutton was an 18th century revolutionary and that he was a genius, there can be little doubt. He was one of the top-tier intellectuals of the Edinburgh Enlightenment. But the claims of his hagiographers, starting with his protégé, John Playfair, are often false in regard to his contributions to geology. In fact, as one begins to understand what Hutton really thought, it might be said that his ideas are so far outside the modern geological mainstream that one is hard-pressed to find points of commonality! This paper will examine the myths about James Hutton and several important lessons that can be gleaned from their persistence. Figure 2. Hutton was a contemporary of many famous thinkers in the 18th century, including philosophers (top, lighter gray), naturalists (middle, medium gray), and theologians (bottom, darker gray). Hutton cannot be understood apart from this context—his thinking was influenced by many of them, especially by David Hume, a fellow Scot. First, however, let us examine what we do know about Hutton. He was born in Edinburgh in 1726, shortly before Isaac Newton died. He was the contemporary of John Wesley, Immanuel Kant, David Hume, Adam Smith, Voltaire, Giovanni Arduino, the Comte de Buffon and Abraham Werner. He studied in Edinburgh, Paris and Leyden, receiving a degree in medicine in 1749, though he never practised. He lived briefly in London before deciding to take up agriculture at his family farm south of Edinburgh, having prepared himself by working with a Norfolk farmer for two years. He spent 1754–1767 working his own land, and was reported to be an innovative and hardworking gentleman farmer. During that time he also pursued his longtime interest in geology, and when he moved back to Edinburgh in 1767, he was recognized as a leading ‘mineralogist’ in Scotland. His last thirty years were spent as a full-time intellectual (a ‘savant’ in Rudwick’s terminology), before he died there in 1797. His contribution to geology came first in a paper presented to the new Royal Society of Edinburgh in 1785 (published in their first transactions in 1788). It was titled Theory of the Earth, or an Investigation of the Laws Observable in the Composition, Dissolution and Restoration of Land upon the Globe. After taking time to publish several other books, Hutton expanded the paper into a multivolume book, Theory of the Earth, published in 1795, shortly before his death. Hutton was modified and defended by his student, John Playfair,5 and lionized by Charles Lyell.6 Even today we are taught about the origin of geology via the famous British trio, who appear as some sort of Copernicus–Galileo–Newton triumvirate in developing the new science. But the history of science has led to some rather interesting modifications of this tale. Rudwick and Gould have identified at least five myths about Hutton’s work. These are interesting both from the perspective of our historical understanding and the ongoing clash of worldviews between Christianity and naturalism. Hutton was not a pioneer—he was just one member of the elite intellectual herd. However, the truth of the matter is somewhat different … actually it’s a lot different! Hutton is renowned for his uniformity of rate, and ‘proofs’ of a vast prehistory. While it is true that he held these positions, what is omitted is the cogent fact that most other naturalists in Europe did too, and that many published similar ideas long before Hutton! Hutton was not a pioneer—he was just one member of the elite intellectual herd. Arguments for an old earth had been made at least since Buffon’s 1749 edition of his Histoire naturelle, and a general assumption of uniform geologic rates was prevalent among most 18th century savants. 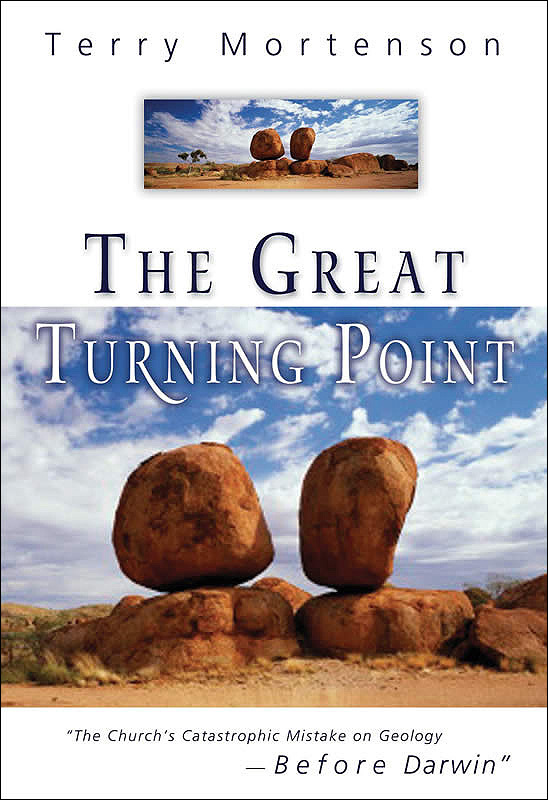 ‘Many years later, after Hutton’s death, Playfair recalled how Hutton had expounded on the spot his interpretation of the long sequence of events that had produced what they saw before their eyes, and he recalled that “the mind seemed to grow giddy by looking so far into the abyss of time.” The idea of time as an abyss was borrowed from Buffon, but it encapsulates what Playfair’s generation (and others since) found most striking about Hutton’s system. And it was not just Buffon (although he probably deserves a more prominent role in developing the idea). Laplace, Desmarest, Saussure, Souvier and even Werner were only a few of the many naturalists who advocated an old earth with an extended prehistory. Among the intellectual elite, it was the majority position at the time. Despite later propaganda, the (more or less) biblical position of Steno, Burnet, Woodward and Ray had already given way to a new secular alternative. Hutton—through an interesting twist of history—simply became the figurehead for the 19th century mythos. Perhaps there is some truth to the idea that the winners write history. After winning the Napoleonic Wars, and after Lyell’s triumph over Cuvier, it may be that a British patron saint of geology was inevitable. Rudwick makes it clear that Hutton was not original in his concept of an old age for Earth. But even more arresting is the fact that Hutton’s system had very little to do with time as we perceive it. We see time in the Christian mode—a linear expanse with beginning and end, filled with contingent unique events. Hutton did not. Instead, he advocated an indefinite ahistorical past, a cycling mechanistic world where erosion wore the land down and heat pushed the land back up—all to maintain a perfect habitation for all of his deistic god’s creatures. Therefore, he was totally unconcerned with Lyell’s vision of a linear prehistory of unique, unpredictable events. His focus was on the cyclical repetition of uplift and erosion, operating like a Newtonian machine, without regard for time or origins. In the early 1800s, geologists were striving with each other for personal prominence and to shape their new science. Cuvier, Agassiz, Lyell, Murchison, Sedgwick—all shared a burning desire to be thought of as the midwife of geology, and have their frameworks cemented into place to guide its future development. Lyell won that fight, but he needed a historical figure to serve as a figurehead for his system. Given the culture and politics of the time, it obviously could not be a Frenchman. Britain sat astride the world militarily and economically; it must also do so geologically. So it is little wonder that Lyell created the historical lineage of Hutton and Playfair, which would inevitably lead his reader up to its culminating genius—the ‘humble’ author of Principles of Geology. Hutton and his uniformitarian predecessors and followers are usually depicted as empiricists. The new scientists courageously sought actual evidence in the field, as opposed to the theologians who stayed in their ivory towers and buried their noses in the Bible, or the rational philosophers who could not see beyond their deductive theories. Once again, to see the truth, we need to swing our perspective 180 degrees. The incorrect conclusion about Hutton’s empiricism rose from an erroneously modern view of him as a scientist. In reality it is more accurate to view him as a philosopher—a system builder—someone who wanted to derive a theory of everything. That was evidenced in his written works. Between 1785, when he first presented his geologic paper, and 1795, when it was published as a completed book, he was busy writing books such as: Natural Philosophy (1792), Light, Heat, and Fire (1794), and Principles of Knowledge (1794). It is more reasonable to class Hutton with men like Hume, Kant, Spinoza and Hegel, rather than modern earth scientists. Hutton therefore was not an unbiased objective observer of nature; he was committed to a worldview that diverged from Christianity, and he built a system of thought within the constraints of that worldview. It was quotes like this that forced Playfair and Lyell to speak of Hutton’s difficult writing style and divert people from letting Hutton be Hutton. It seems to be a recurring myth that any scientist who proposes a theory opposed to the Bible automatically assumes the role of a martyr—another victim of the Spanish Inquisition roasting over a slow flame until he recants. Not only is this ridiculous analogy wrong in its understanding of the Spanish Inquisition,24 it is nothing more than an offensive ploy to silence Christian criticism. Hutton is no exception. Contrary to myth-mongers from Geikie to Repcheck, Hutton did not single-handedly take on the monolithic medieval church and bravely defy it by preaching against the Ussher timescale and Noah’s Flood. The church’s influence, both Catholic and Protestant, over the universities had declined precipitously by 1700 in a Europe weary of religious wars. 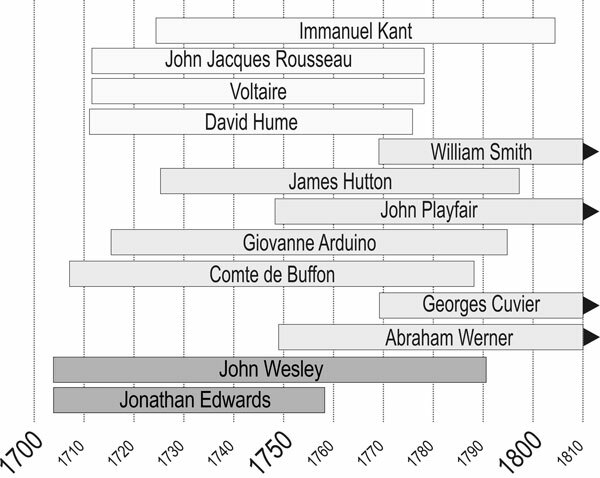 The Puritan flame, which burned so brightly in England in the 1600s, was extinguished by the late 1690s.25 Although there were powerful revivals in the 1700s, they never seemed to touch the intellectual elite. Thus, there was no great and powerful biblical church for Hutton to face. His rejection of Genesis as reliable history was simply the intellectual mainstream of the time. The church’s ability to force Buffon to make no more than a pro forma nod to the Bible after the publication of his first edition of his natural history26 was a sign of its waning influence, not its power. Furthermore, the participation of many clerics in the Enlightenment project illustrates that the real situation is quite different from that portrayed by anti-Christian scare-mongers of later decades who wanted a gullible public to see the Inquisition behind every church door. The true facts are these: there is absolutely no valid historical record that Hutton was ever persecuted by any church, or that he was ever even concerned about such action. He did not suffer socially from his beliefs or theories and the rebuttals of his work were all based primarily on logical and scientific errors—written by fellow savants, not by cloistered monks. And such opposition was merely the normal intellectual give and take of the day. Hutton had no great enemy. He faced nothing like the debate between Cuvier and Lyell. Instead, he rubbed elbows with Edinburgh’s upper crust and his 1785 presentation did not alter that standing in the least. If anything, the church was not an issue in Hutton’s work nor, sadly, in his life. Geology students are taught that Hutton’s brilliant ideas were not accepted for several decades because he couldn’t write. Repcheck plays a variation on this theme by claiming that he wrote poorly because of his declining health. According to popular tradition, his book was virtually incomprehensible. Only when it was ‘interpreted’ some years later by his protégé, John Playfair, did his brilliance shine through. Hutton was not clarified by his successors; he was folded, mutilated and spindled! His theories were twisted and molded to fit those of his supposed disciples, and not allowed to stand on their own. Geologists are fond of thinking that Hutton, Playfair and Lyell form a historical progression similar to that of Copernicus, Galileo and Newton. Yet the reality is quite different. Why then did the myth persist so successfully down to the present? The best explanation is the simplest—that worldview commitments create blind spots, and that everyone clings to things that justify their beliefs. Atheists accuse Christians of clinging to their biblical myths, and yet they remain blind to their own love of myths. Truth is clearly a commodity in much scarcer supply than we like to think. 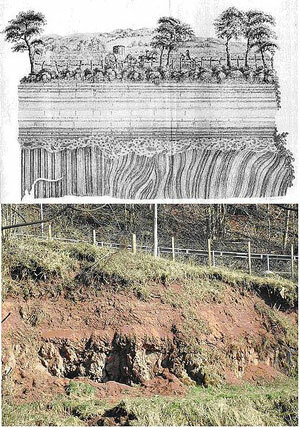 History now shows us that James Hutton was not an innovative geologist who invented uniformitarianism and deep time. His use of both of those concepts was secondary to his deistic eternal ‘succession of worlds’ and was nothing unusual for his generation. He certainly was familiar with the works of Continental savants such as Buffon, Desmarest, de Luc and Werner, and would have found ample examples of both concepts in their work. So why did Hutton emerge as the ‘father’ of modern geology? 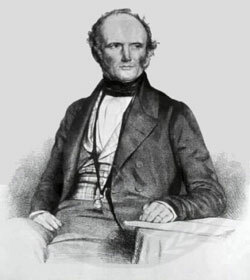 One clue might be found in the cultural context of the early 1800s, when Playfair and Lyell began pushing him as the paragon of geological thought. In the late 18th century, the pre-eminent naturalists were French. But during the 19th , they were predominantly English, and the new science of geology bore a heavy English flavour. The names we remember today are Buckland, Sedgwick, Murchison and Lyell. There are several likely explanations for this transformation. One is the French Revolution and the Napoleonic wars. National boundaries had proven unstable, and national pride became the mask covering national fears of another chaotic episode. Europe recoiled from war and France was no longer the cultural light of the continent—it was the source of an atheistic plague that had decimated the peace and prosperity of the civilized world. Nationalistic pride loosened the bonds of the ‘Republic of Letters’ and created nationalistic competition even in the sciences. Britain led the fight against Bonaparte. Wellington was the hero of Waterloo. Their victory over France set them at the apex of military and political power, and the British Empire remained in that position until World War I. The British Navy ruled the world, from the Channel to the vast reaches of the Pacific Ocean. If Britain’s military might ruled the world of politics, then why should not Britain’s intellectuals rule the world of letters? 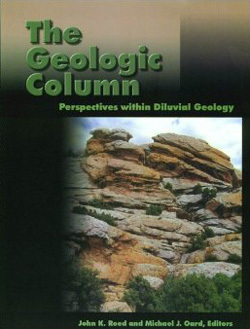 A microcosm of that cultural conflict was the fight between Cuvier and Lyell for the new geology. Though both dismissed biblical geology, they fought for pre-eminence in a new secular science. Lyell’s victory—though intellectually premature from our present point of view—heralded the British dominance of geology. A British science required a British founder, and Hutton was the best British candidate. In that sense, the mythological Hutton can be seen as a product of Lyell’s cultural imperialism. But the mythology of James Hutton raises a much more interesting question about geology itself. If a true understanding of James Hutton was lost before he was cold in his grave, how can we possibly have confidence in the pronouncements of the same geologists that distorted his story when they leap back millions of years into an unobserved past? If they cannot get the late 1700s right, why should we believe what they say about the Devonian? Worldview commitments blinded them for two centuries to the historical truth about James Hutton; is it not reasonable to suppose that those same commitments could blind them to the historical reality of Genesis? Baxter, S., Revolutions in the Earth, Orion Books, London, p. 7, 2003. Return to text. Repcheck, J., The Man Who Found Time: James Hutton and the Discovery of the Earth’s Antiquity, Perseus Publishing, New York, 2003; See review, Walker, T. The man who made the wedge: James Hutton and the overthrow of biblical authority, J.C. 18(2):55–57, 2004. Return to text. Gould, S.J., Time’s Arrow Time’s Cycle: Myth and Metaphor is the Discovery of Geological Time, Harvard University Press, Cambridge, MA, 1997. Return to text. Rudwick, M.J.S., Bursting the Limits of Time: The Reconstruction of Geohistory in the Age of Revolution, University of Chicago Press, Chicago, IL, 2005. Return to text. Playfair, J., Illustrations of the Huttonian theory of the earth, Edinburgh, 1802. Return to text. Lyell, C., Principles of Geology, 1830– 33. Return to text. Repcheck, ref. 2, p. 4. Return to text. Rudwick, ref. 4, p. 169. Return to text. Rudwick, ref. 4, p. 158. Return to text. Gould, ref. 3, p. 66. Return to text. Rudwick, ref. 4, p. 159. Return to text. Gould, ref. 3, p. 79. Return to text. Rudwick, ref. 4, p. 162. Return to text. Hutton, J., Theory of the earth; or an investigation of the laws observable in the composition, dissolution and restoration of the land upon the globe, Transactions of the Royal Society of Edinburgh 1:209–304; p. 288, 1788, <www.mala.bc.ca/~Johnstoi/essays/Hutton.htm>, accessed May 2008. Return to text. Rudwick, ref. 4, p. 164. Return to text. Rudwick, ref. 4, p. 79. Return to text. Rudwick, ref. 4, p. 160. Return to text. Rudwick, ref. 4, p. 161. Return to text. Gould, ref. 3, pp. 66–67, 72. Return to text. Reed, J.K., Klevberg, P., Froede Jr., C.R., Akridge, A.J. and Lott, T.L., Beyond scientific creationism. 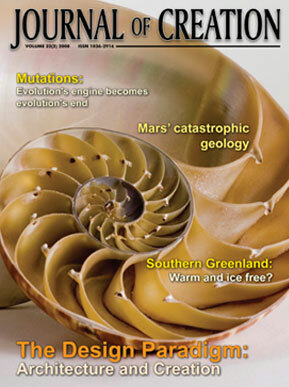 Creation Research Society Quarterly 41(3):216–230, 2004. Return to text. Rudwick, ref. 4, p. 167. Return to text. Hutton, ref. 14, p. 304. Return to text. Rudwick, ref. 4, p. 168. Return to text. Stark, R., For the Glory of God, Princeton University Press, Princeton, NJ, 2003. Return to text. Packer, J.I., A Quest for Godliness: The Puritan Vision of the Christian Life, Crossway Books, Wheaton, ILL, 1990. Return to text. Rudwick, ref. 4, pp. 141–142. Return to text. Rudwick, ref. 4, p. 126. Return to text. Gould, ref. 3, p. 93. Return to text. Gould, ref. 3, pp. 94–95, 96. Return to text.